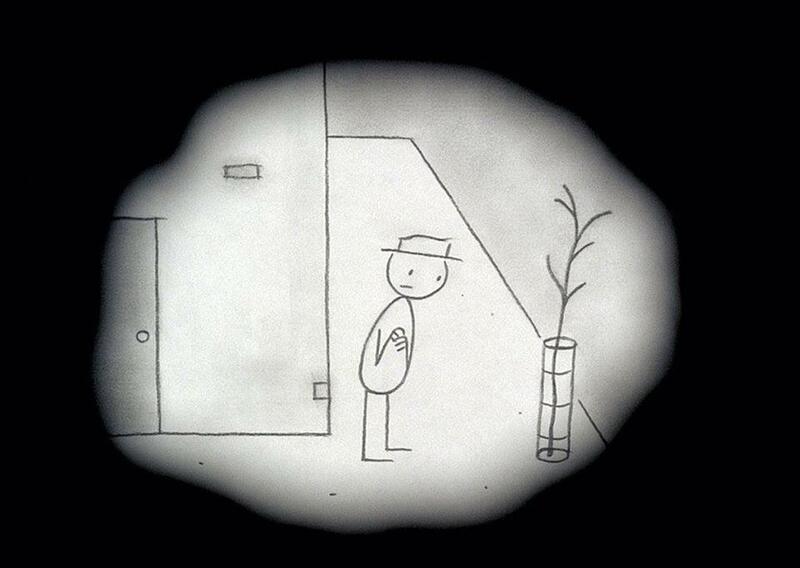 IT’S SUCH A BEAUTIFUL DAY (Don Hertzfeldt 2012) is a compilation of three shorts focused on the ailing Bill, as a disembodied narrator (Don Hertzfeldt) details his mundane daily exploits. As the shorts progress, Bill’s mental and physical health deteriorate and the trilogy’s conclusion appears obvious: that Bill is not long for this world. After a long, harrowing sequence in which the extent to Bill’s mental degradation is made clear, the anthology reaches what appears to be a natural conclusion: a serene scene in which Bill, lying atop a hill, peacefully passes away. Sad as it is, this scene offers something a refuge from the pain of the preceding sequence and the tragedy of Bill’s life depicted across the trilogy. His death was inevitable and was at least more tranquil than much of his life. Regardless of how satisfying or thematically appropriate Bill’s death is, it is met with an objection from - in a rather postmodern twist - the narrator himself. “He can’t ever die!” he insists. And thus the film continues with the narrator recounting how Bill actually survived and would go on to never age, to have various partners and families, and to experience everything there is to experience, never dying even as entropy devours the cosmos around him over the span of millennia. For IT’S SUCH A BEAUTIFUL DAY to subvert its own narrative setup so radically seems a strange choice but this is not without purpose. Firstly, it is important to acknowledge that the trilogy functions first and foremost as a tragedy, one imbued with a comedic edge but a tragedy nonetheless. Tragic stories are commonly structured so their characters are headed for a calamitous fate by the narrative’s end and IT’S SUCH A BEAUTIFUL DAY is no exception. The shorts fundamentally revolve around Bill’s quality of life, worsening as he slowly dies, and how he is powerless to stop this. Yet, by describing how Bill, doomed to die slowly and painfully, actually lived happily ever after, the narrator is offering a form of indulgence for its audience. What if all the tragic endings you have ever experienced did not have to be tragic? What if the characters you have witnessed suffering could be afforded happiness after all? What makes IT’S SUCH A BEAUTIFUL DAY’S closing moments particularly impactful is how this is taken to its furthest possible extreme. Bill does not just get a happy ending, he gets the happiest ending imaginable, achieving immortality and living the richest life possible. It is the ultimate indulgence. What makes this sequence even more impactful is how sincere it is. The narrator never acknowledges how inappropriate this ending is; he recounts Bill’s fate joyfully. It may be painfully obvious how clearly wrong this ending is, how tonally jarring it is and how it was not setup ahead of time. But IT'S SUCH A BEAUTIFUL DAY refuses to directly acknowledge any of this. It leaves us free to enjoy the narrator’s indulgence as much as he does and never answers definitively how wrong such an indulgence is. That it is for us to decide is a crucial part of what makes Hertzfeldt’s trilogy such a provocative story.